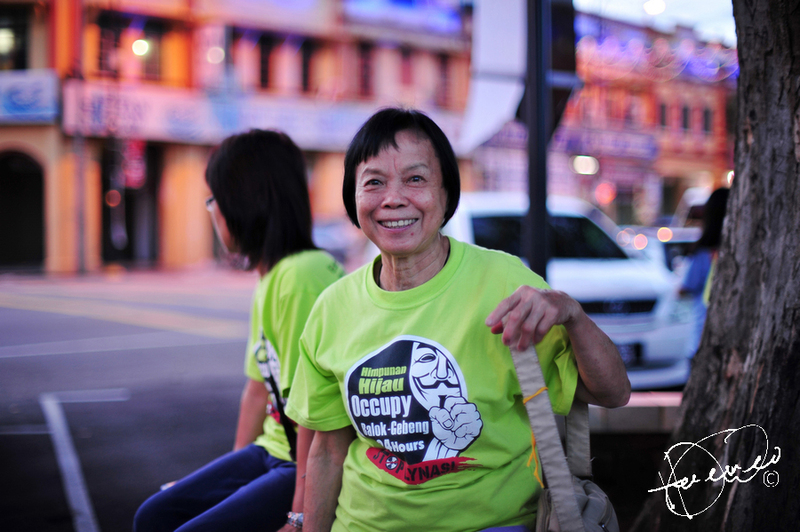 the 71 year-old Aunty Mei, one of the Green Walkers for the whole journey. 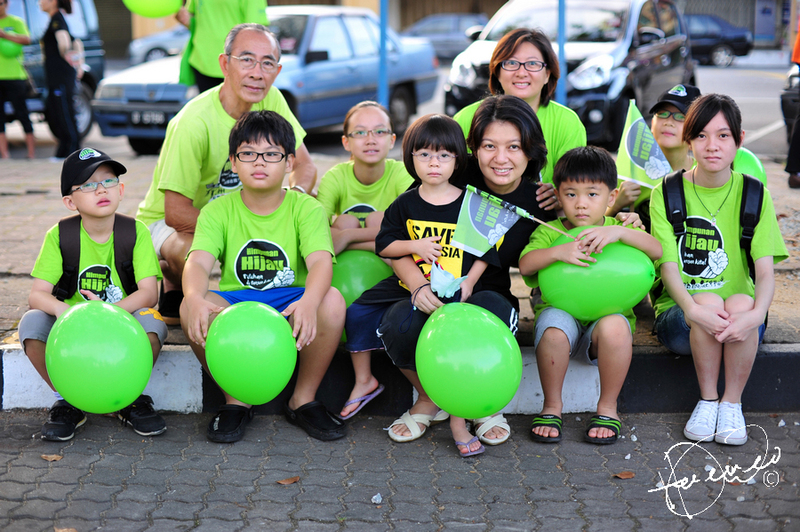 Sim and his family, came all the way from Pengerang, supporting the Green Walk. 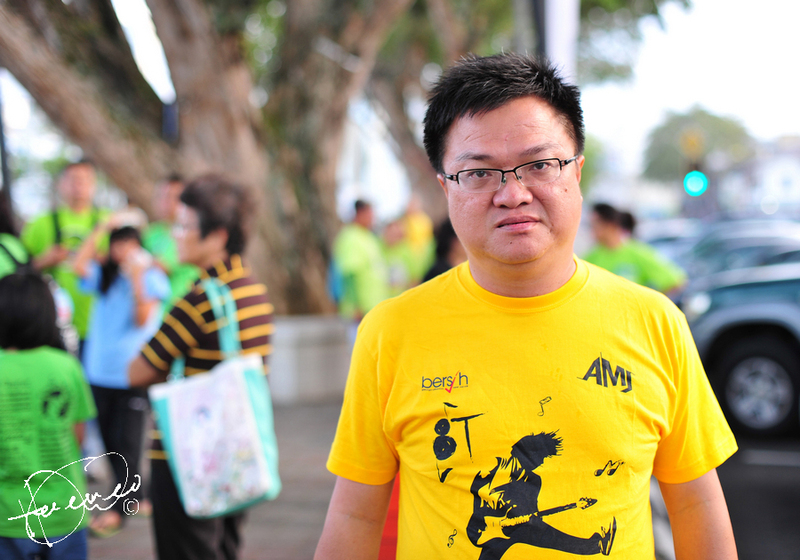 Wong Chin Huat- a Malaysia political scientist, an university lecturer, a political activist, also a columnist. a farmer+barefooter, wanting to bring out environmental concern. 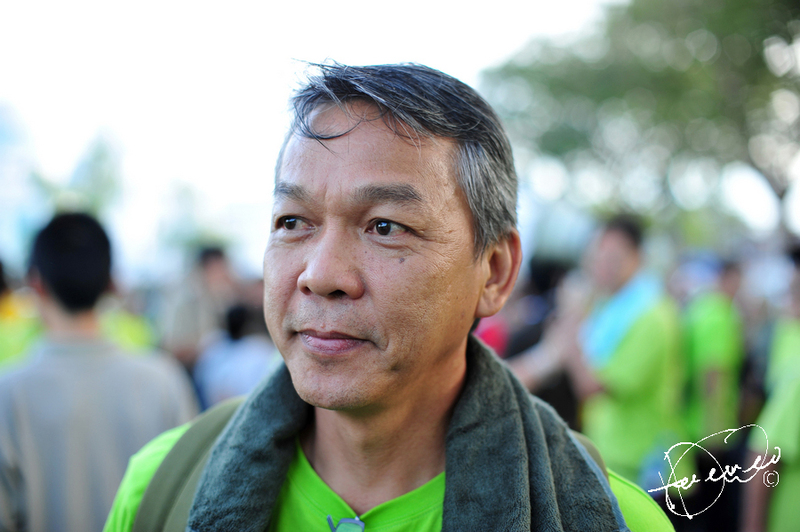 "i support the green movement, because the Buddha which created this clean territory, a country must be clean, including green, thus i came out to support this movement." to defy the lost in translation, here's what he originally said in Chinese. 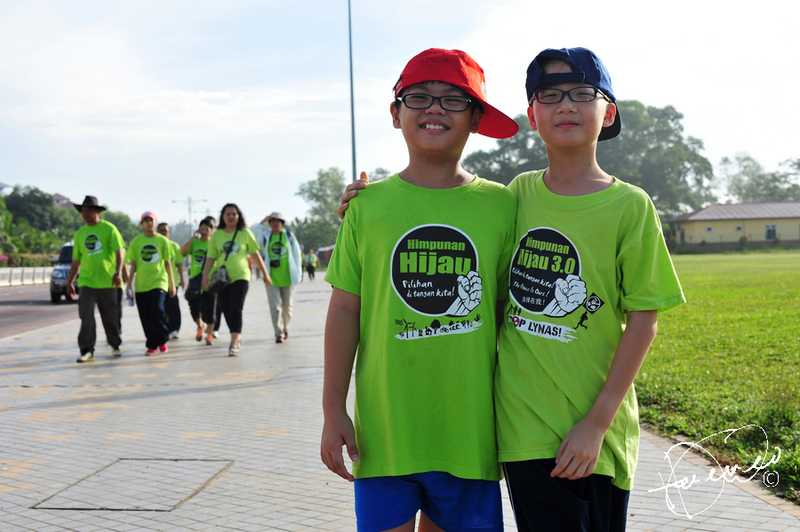 Don't turn Kuantan town into the shadow of cancer, i want to grow up healthily! 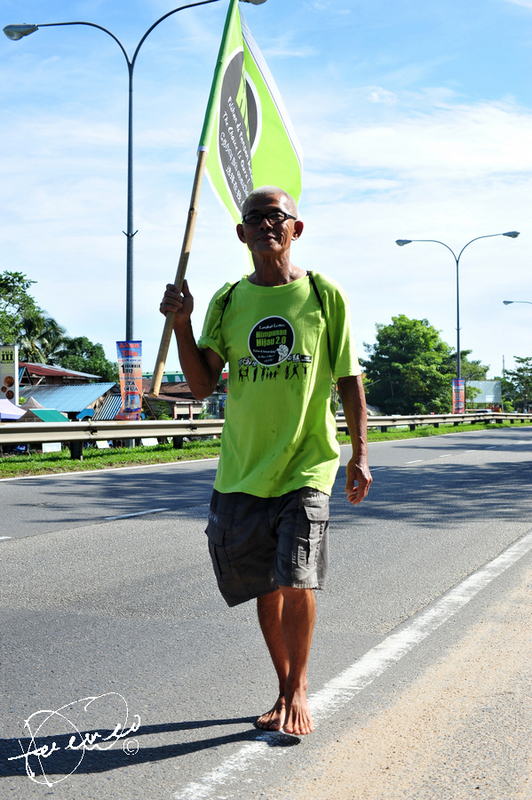 Another businessman+barefooter, "Go Green, Go Barefoot" he said. 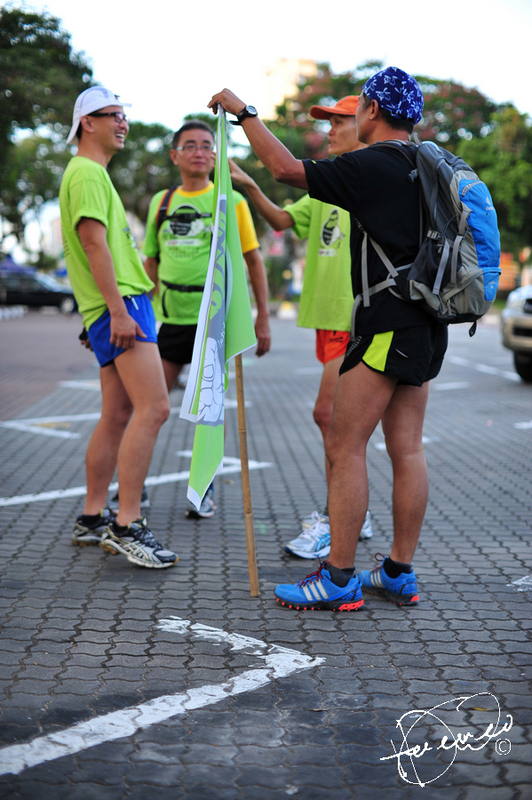 4 representative from the Runner club. 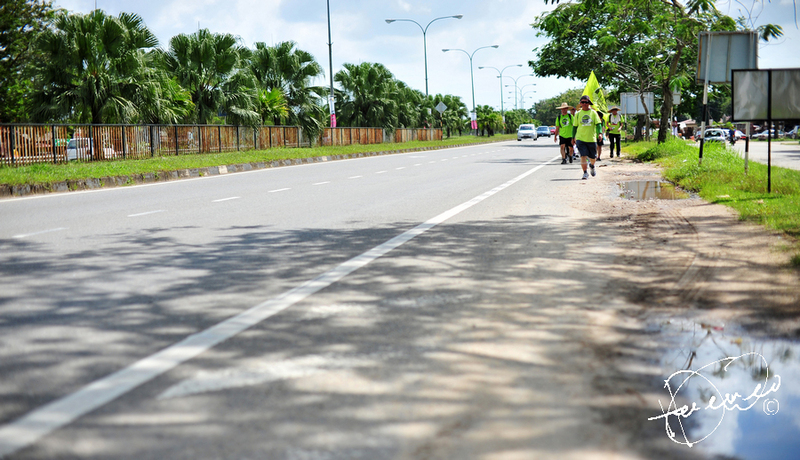 Lone ranger from bike racing club. 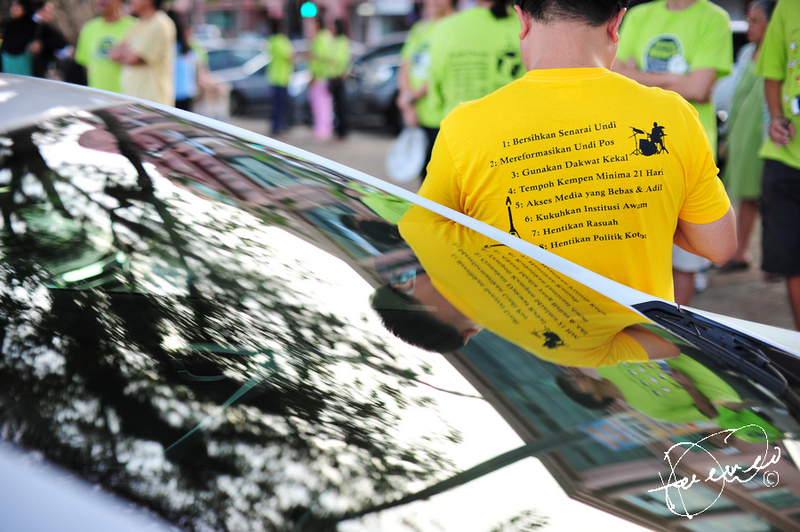 Also, safe guarding the Green Walkers to destination. 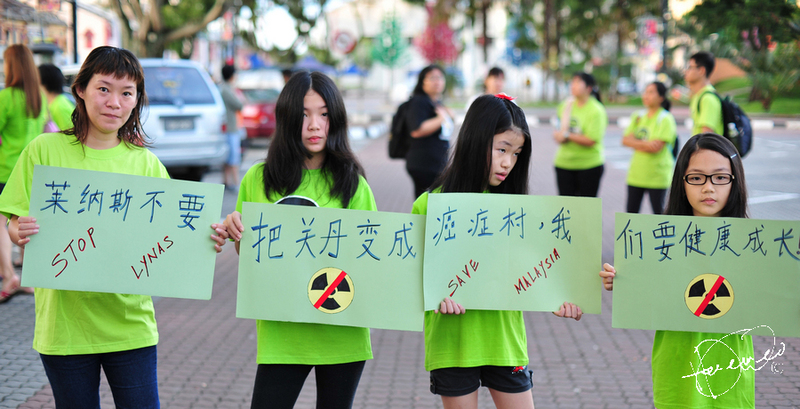 the children wanting a healthier, cleaner, better future. 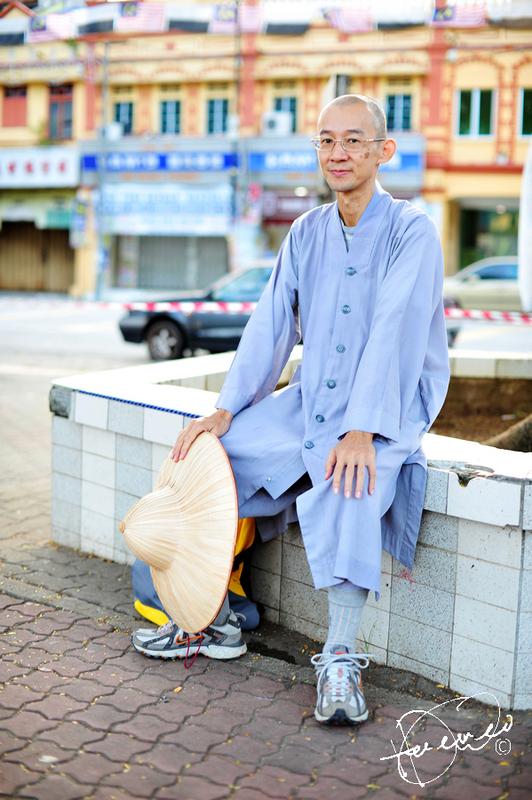 56 year-old Loong, took a 2 weeks leave from work, "just living is not enough! 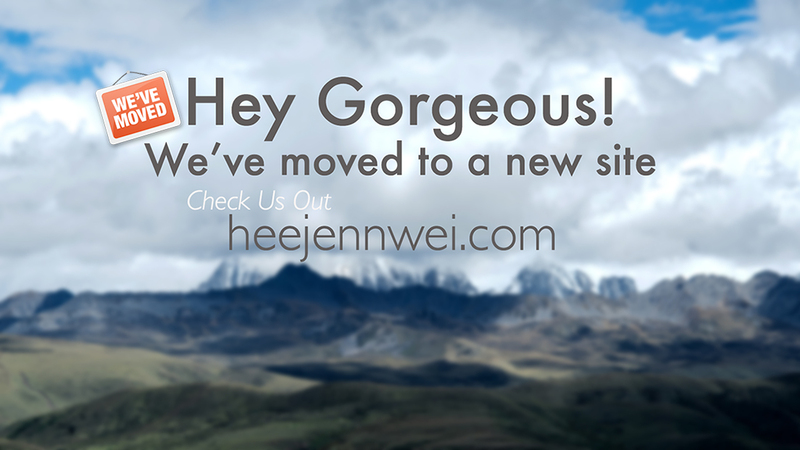 it also have sunshine, clean air, and freedom!" 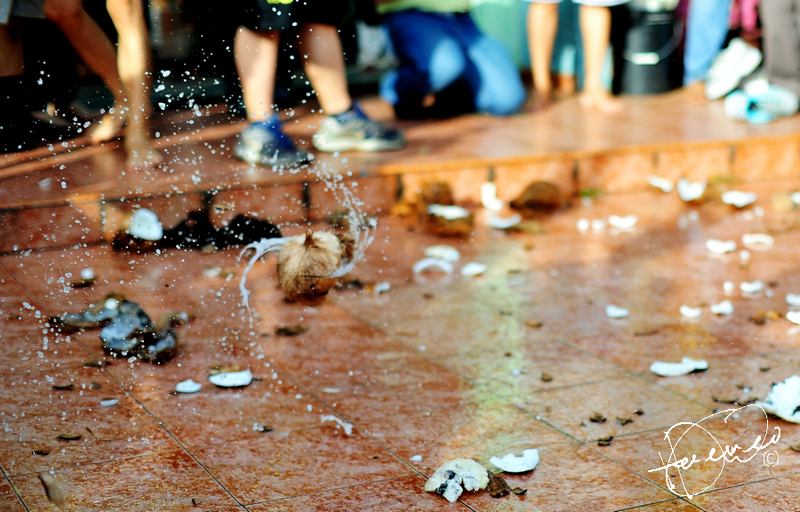 Keep your barefoot on the ground, let your heart soar high! never surrender your chill of environment. Why? 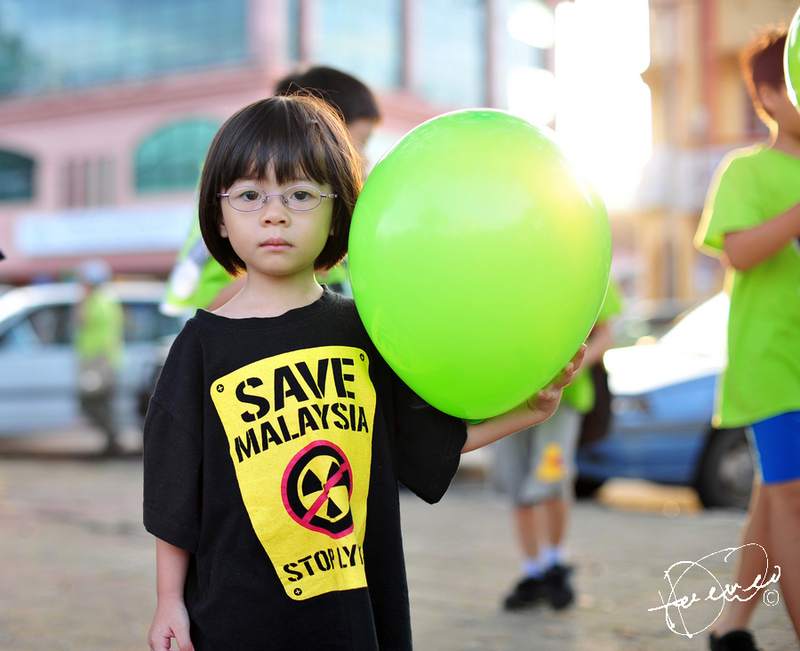 that we have to fight the government to save the environment? 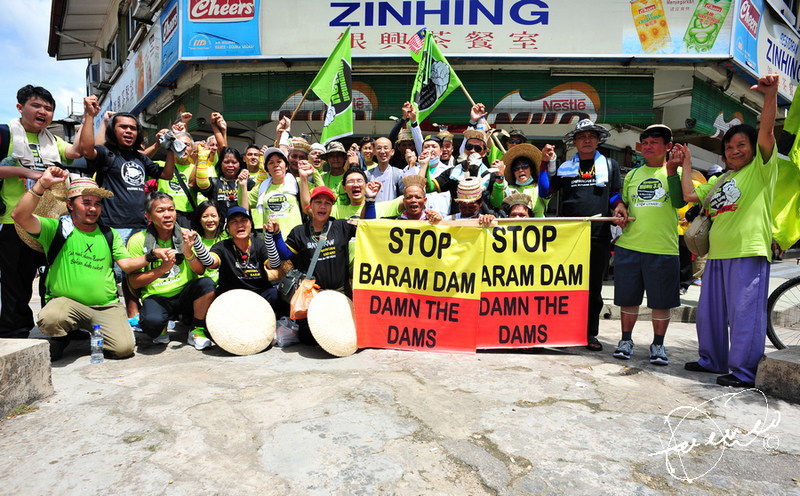 the Murum's Penan, "Stop the Dam in Baram!" “The people will never retreat a single-step nor tolerate stagnancy. 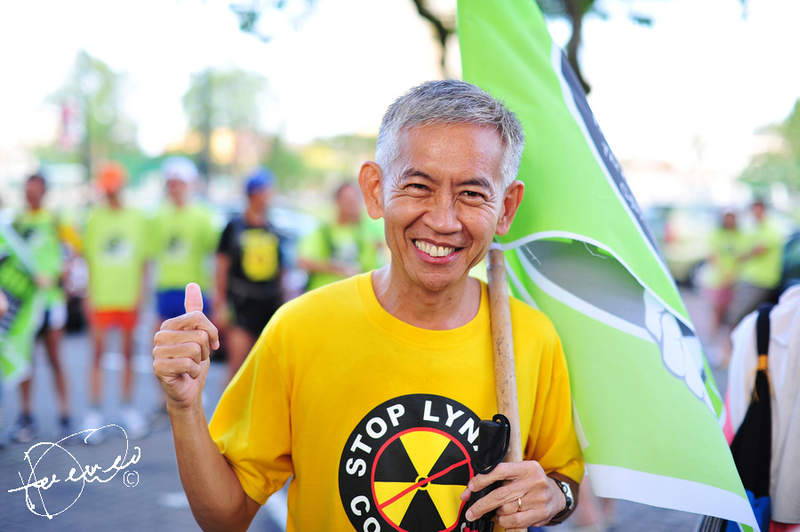 We will continue to push forward. 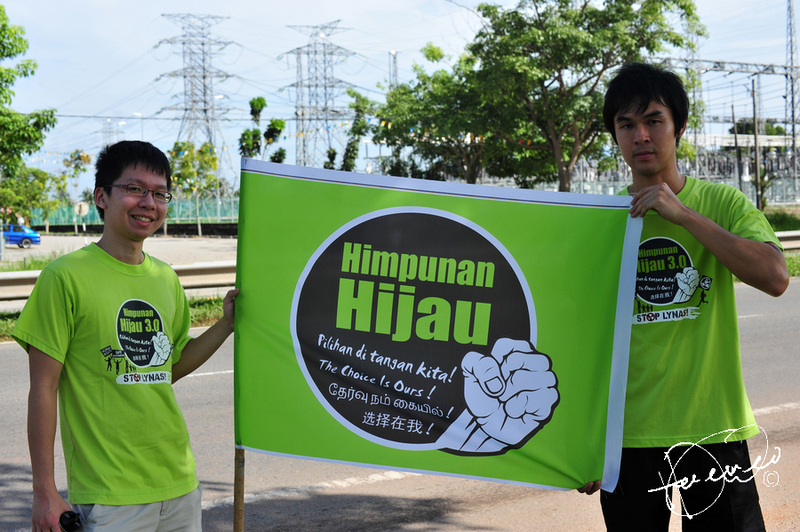 Our second wave of people’s actions shall kick-off immediately!” said Wong Tack, chairperson of Himpunan Hijau. 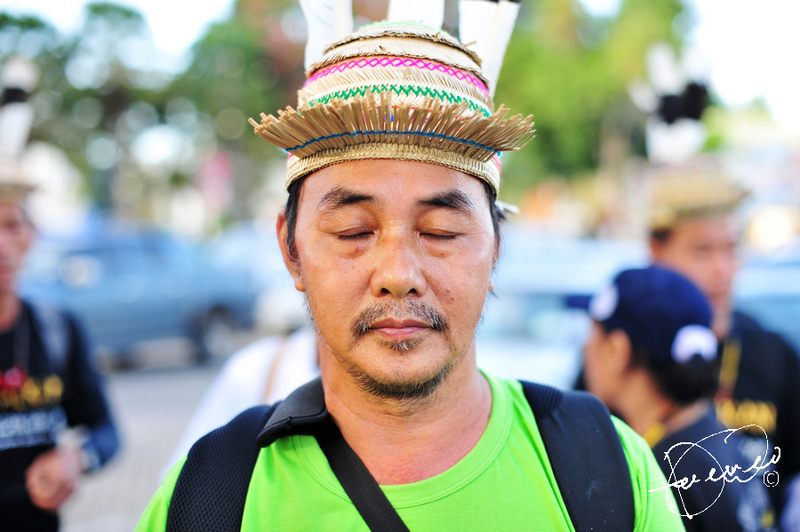 Philip Jau, Chairman of Baram Protection Action Committee (BPAC), "when i meditate, the strength comes to me." he said. 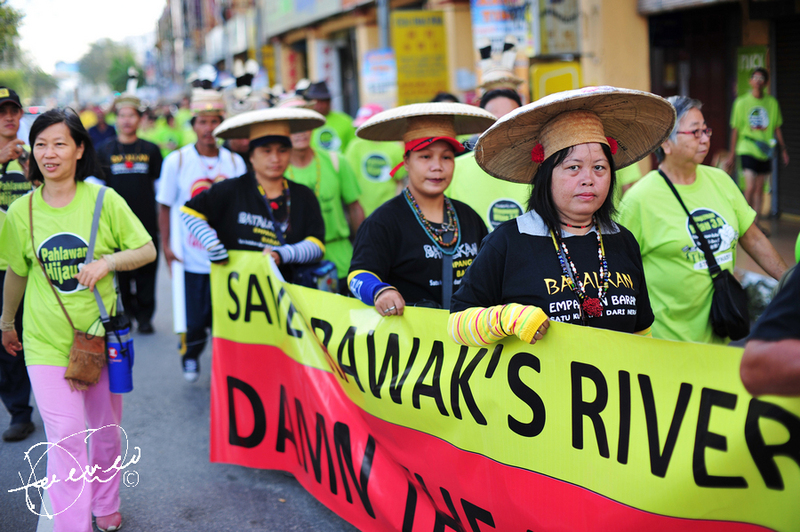 We were displaced from our ancestral lands as a result of ventures such as the exploitation of natural resources. 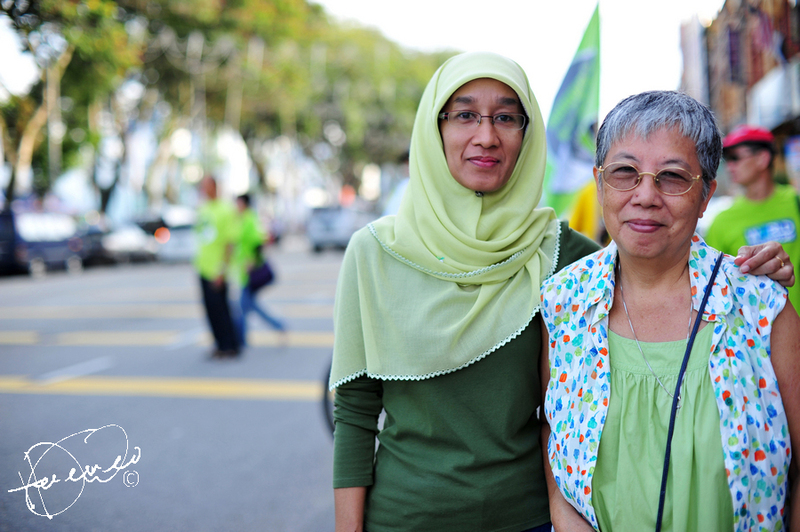 Denial of our right to control our own development based on their own values, needs and priorities, a lack of - or very poor - political representation and a lack of access to social services. 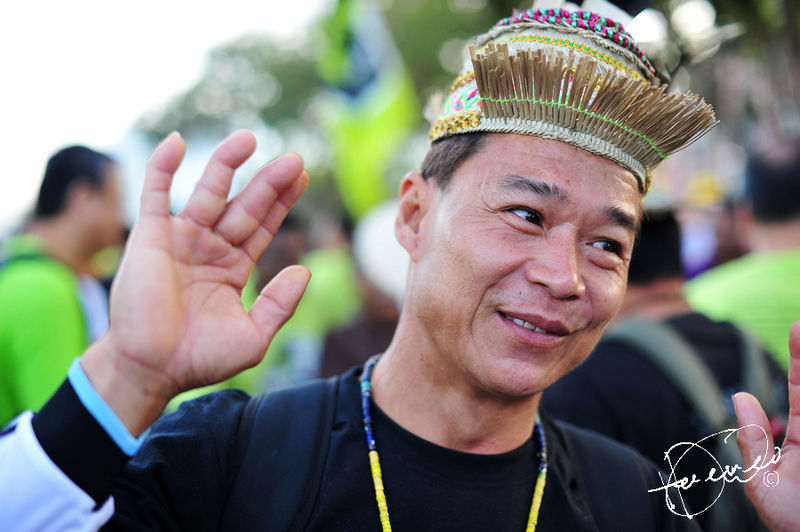 The human rights of our peoples who have endured centuries of exploitation and marginalization. And we are forcibly removed from our lands without prior consent! DOA, Prayer, and Chant before the beginning of "war". 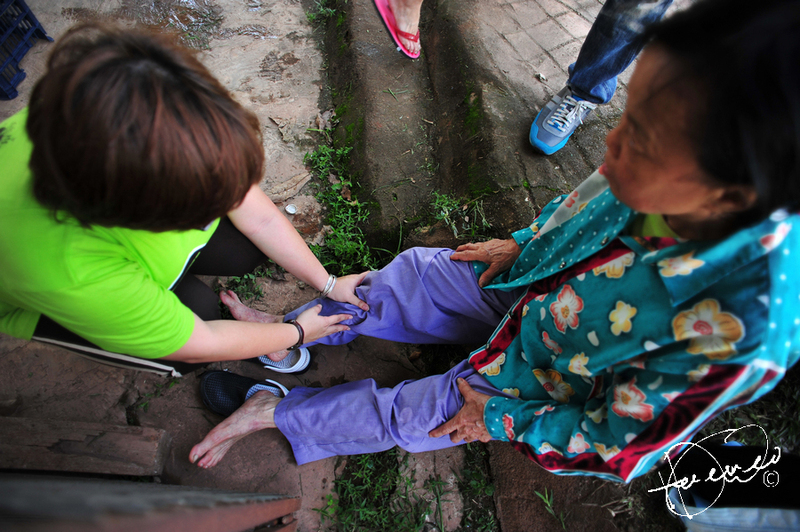 "i'm a farmer all my life, i am literally illiterate, but the one thing i know best, is walk, barefooted!" 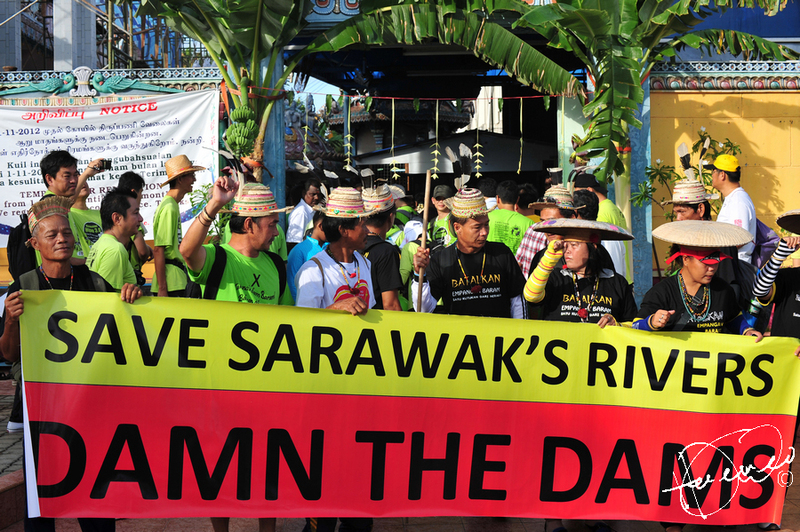 Save the Sarawak River! Damn the Dam! "We'd been friends for life, we don't want our children to cope with the fear, worry and depression, some mess we'd left behind." 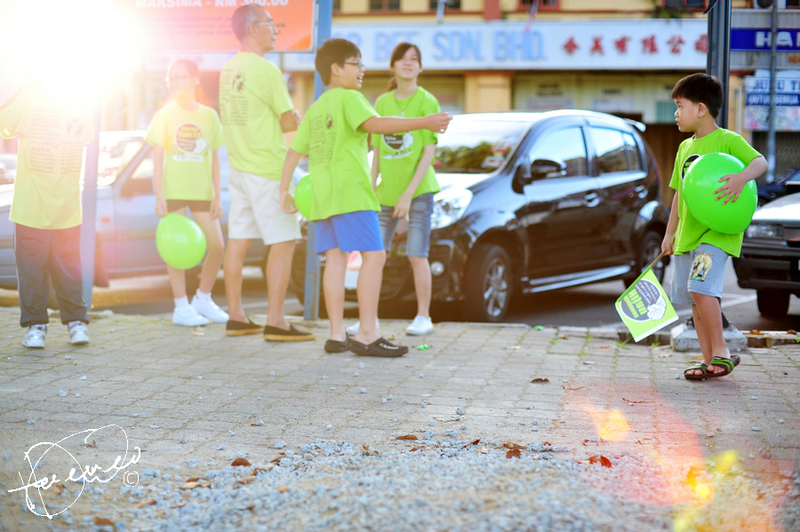 Aunty Mei, leading the charge. 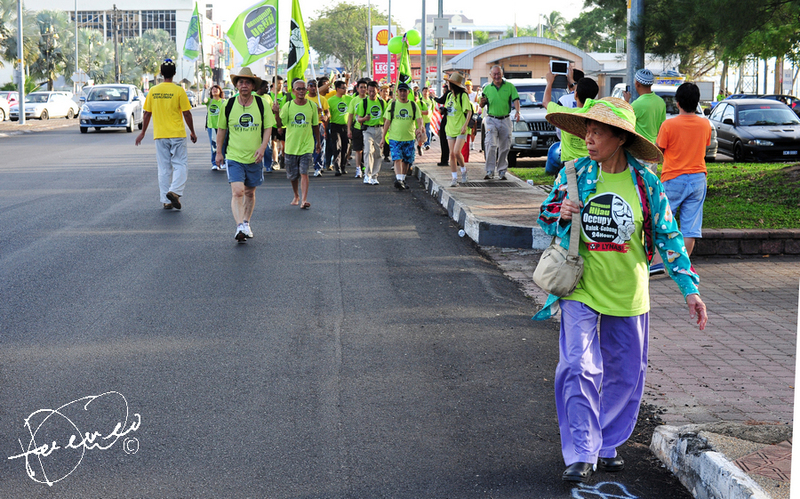 Approximately 400 participants join the first day morning green walk from Mosque to Sri Mariammam Temple. "Uncle, where are your friends? 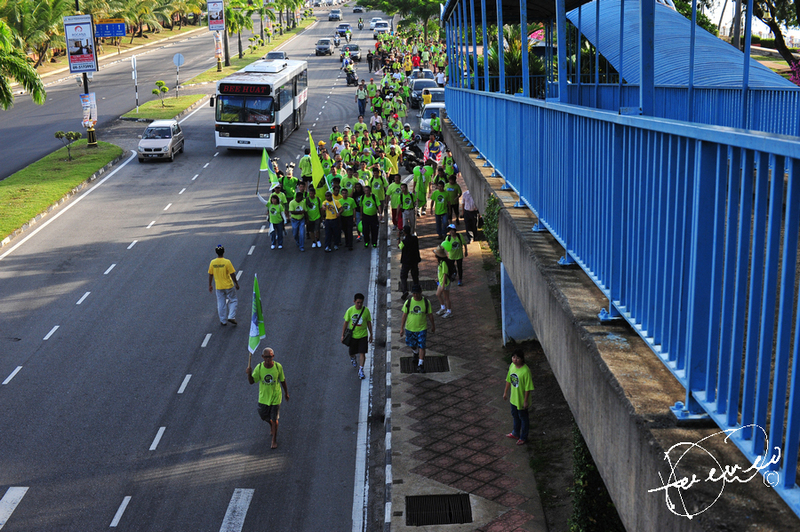 Why aren't they supporting the Green Walk? We are in Standard 1, we come in team!" 2 little boys asked. 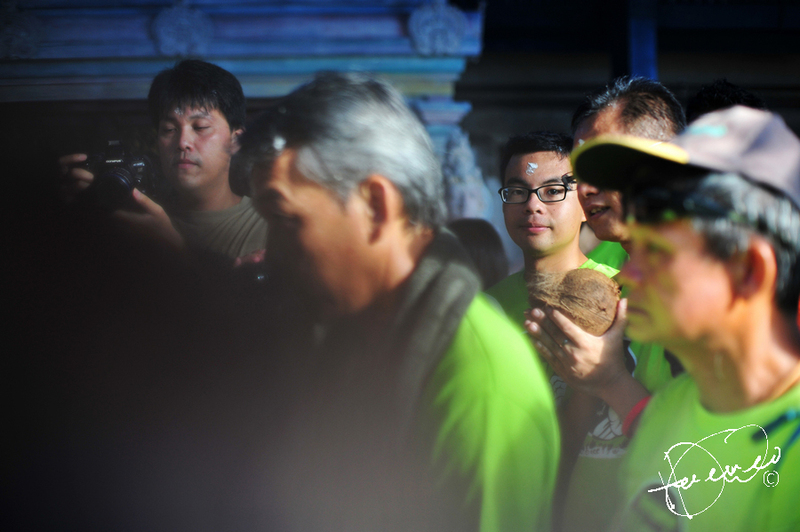 Murum's Penan, chanting outside Sri Mariammam Temple, while the rest of the Green Walkers getting their blessing. Little kiddo discussing something about grass. You see, Government doesn't create wealth, the only job Government need to do is to respect their stakeholders, us, the citizens. What holding you back when people from 5 y.o. to 72 y.o. 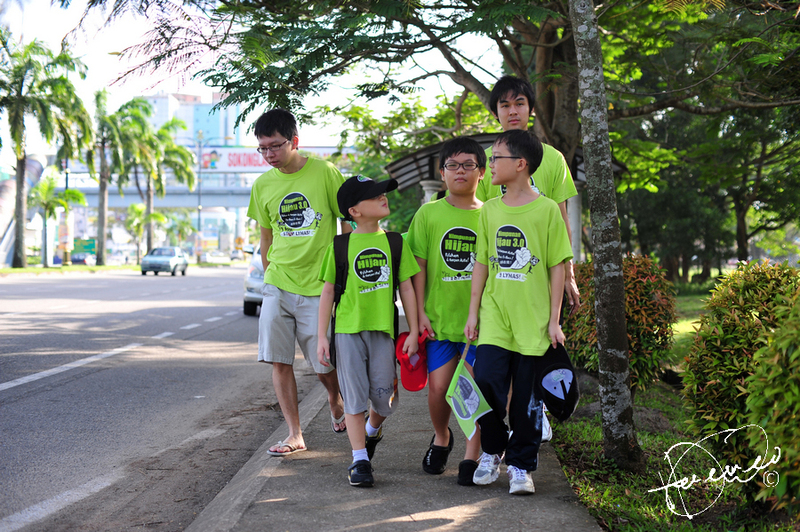 also participate the Green Walk? 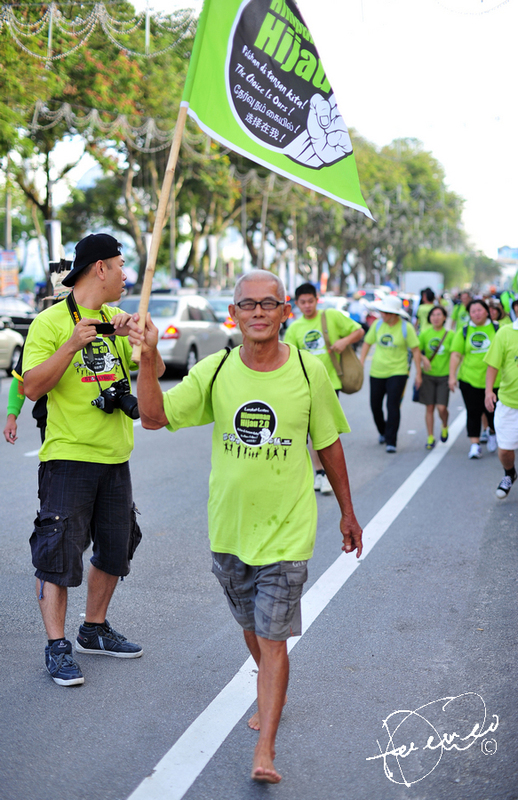 29 green walkers (excluding the media team), carry on completing the 300km walk to Parliament. 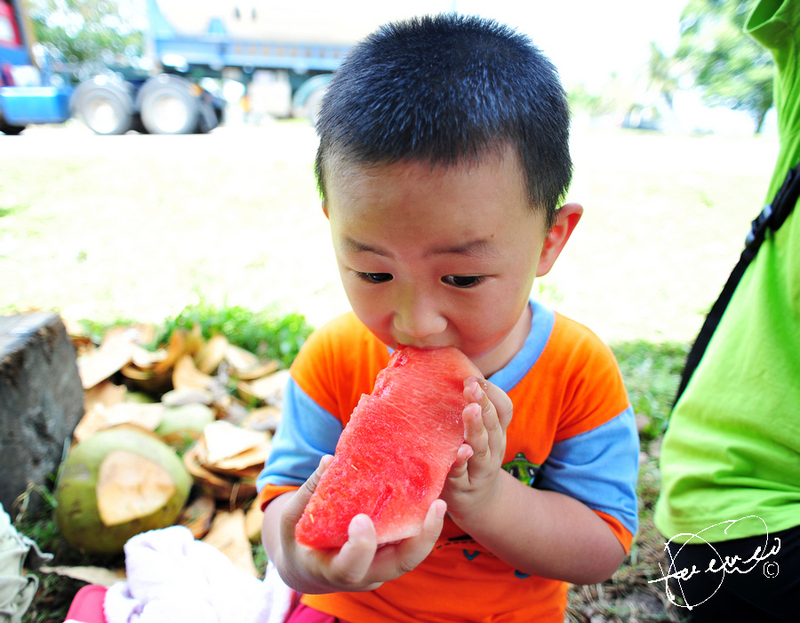 5 year old boy rest for watermelon and drink, he carried on at least 18km until the heavy downpour and his dad has to pursue him to stop. 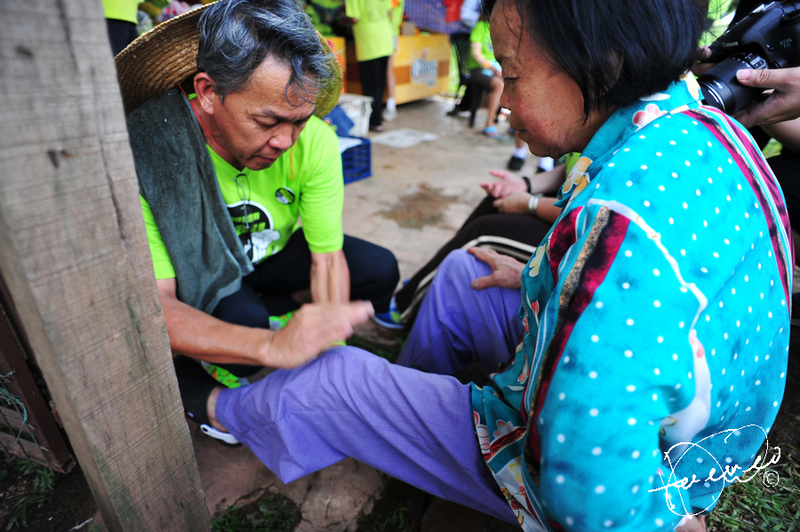 Aunty Mei enjoying Kung-Fu massage from Wong Tack.